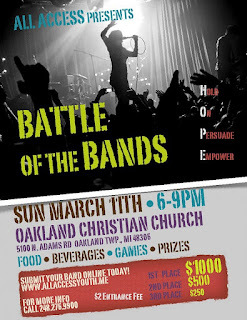 In response to the recent tragic suicide of another Lake Orion School District student, Oakland Christian Church (OCC) will host Battle of the Bands at 6 p.m. Sunday, March 11. “Battle of the Bands: Fight for Hope will promote HOPE (Hold On, Persuade, Empower) to local teens after the latest tragedy they’ve had to face,” says OCC’s Pastor Dominic Russo. This suicide marks the 10th by either current or former Lake Orion students within the past four years and Pastor Russo has been very outspoken in recent months with regard to these tragedies. This latest suicide propelled the community to take action. “The Battle of the Bands exists to give hope, love and a future for the teens of this generation. We are fighting back against the suicide epidemic hitting these teens,” says Russo. The show features several bands including one from Lake Orion High School itself – “Substone," which was founded by the best friend of the latest suicide victim. Three judges will vote to determine the winning bands based on performance, songwriting, audience reaction and overall energy. In addition, audience members will be able to text their votes which will go toward the overall score. The winner of the battle will receive a $1000 cash prize; $500 and $250 prizes will go to the second and third place winners. Sunday’s Battle will be the first in a series of events that will ultimately culminate in a grand prize event this summer at a date TBD. The winner of the finale this summer will receive a free recording and music video shoot sponsored by local Emmy award winning marketing firm DBA Worldwide. At the Battle of the Bands, OCC will be giving away free food, beverages and prizes. There is a $2 entrance fee to partially cover the costs of the event with OCC donating the rest of expenses. For more information, visit allaccessyouth.me. Oakland Christian Church is located at 5100 North Adams Road in Oakland Township.